Only recently have I come to appreciate my quiet, suburban upbringing. My single mother worked tirelessly to provide her kids a safe, secure childhood unlike the one she'd known. The choice to live in affluent, predominately white communities was mom's attempt to help my sister and I overcome the trappings of life in black, female bodies. But of course she couldn't shield us completely. We never feared for our safety, and we always attended great schools. But being one of only a handful of African American kids submersed in a sea of whiteness had its own pitfalls. The often overt bigotry I endured left a stain of insecurity and self doubt on my nascent consciousness. That is the reality of my early existence. "...it wasn't until I went to college at NYU that I began to learn there were derogatory terms used to insult entire races, religions, and ethnicities." Men and women of Color don't get to be blissfully unaware of racial pejoratives. They have their innocence stolen early by hatefulness. It's an awful, unavoidable reality. A reality I sometimes assume the majority of competent beings of all ethnic backgrounds have acknowledged. Then I see a blog post like "Do We Really Think That Headline Was Intentionally Racist," and I'm quickly reminded that willful ignorance of the lived experiences of People of Color persists. 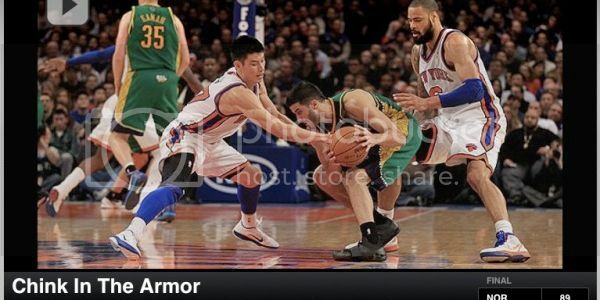 "The Headline" is the one in which Jeremy Lin of the New York Knicks was referred to as a "Chink in the Armor" by Anthony Federico of ESPN.com. Federico was rightfully fired over the incident, but Daisy thinks the outrage toward the writer was unwarranted because she, herself, had never heard the term used as a slur. How is that possible? You ask. Apparently Daisy lives in a utopic bubble wherein you can completely avoid the inconvenient nastiness of a society built on oppression. Fact of that matter is, as I’ve gotten older and somewhat wiser, I’ve made a conscious effort not to learn what these words mean. I can't help but know they exist, but if I don’t ask what they mean or who they're about when I do have the unfortunate chance of hearing them, I’m not inviting the ugly thoughts and stereotypes into my life. It's ok to not know things, but these sentiments evidence a refusal to listen to and trust those whom racism affects daily. I understand it's difficult for many who've always been explicitly catered to to understand this, but it's not always about you. White people get to claim naïveté while simultaneously perpetuating the silencing of minority voices. Because how could they ever have known about the complexities of an existence so far removed from their own? Cluelessness is a cover for flat refusal to self-educate on white privilege. This is, of course, where the Magical Minorities are expected to swoop down, play professor and graciously teach about the damaging racial constructs that have wreaked havoc on POC communities for hundreds of years in this country. I, however, reject that expectation. Because she managed to publish her blog, I am sure Daisy has access to this incredible thing called the internet which facilitates access to countless resources for those who desire to acquire knowledge. The writer obviously has no such yearning--citing an unwillingness to "invite the ugly thoughts and stereotypes" into her life. Here's the thing, Daisy: POC cannot escape that ugly. Once I realized that everyone was, in fact, livid about the usage of the word "chink," despite the fact that the phrase "chink in the armor" accurately described Lin's first real sign of weakness, I couldn't help but think that perhaps it was everyone else who was racist, not the writer. It couldn't have been that when one is constantly beseiged by micro and macro aggressions one becomes adept at spotting them. Nope. We're just oversensitive whiners. Quite frankly I'm amazed by Barringer's audacity in telling POC what they should be offended by, but let's say, for a moment, Federico really did make an "honest mistake." Then at the very least he's an incompetent who still deserves to lose his job for the oversight. If he can't catch a racist pun in the middle of the onslaught of coverage about the implications of Lin's ethnicity, he's grossly negligent. People have been fired for less. Most offensive is Barringer's contention that outrage over Federico's insensitivity is "just as horrible as racism." This is how you know Daisy Barringer truly has no grasp of what racism actually is. Racism keeps ethnic minorities underpaid, underfed, undereducated, and underemployed. That icky feeling you get when someone calls you out on your bull doesn't even come close. Structural oppression persists because of the unwillingness of those with privilege to step outside of themselves. Please excuse me if I'm unmoved by the incredulity of Daisy and others who struggle to figure out how racism works. I've never been afforded the luxury of being so naive.